The Looxcie LX1 wearable camcorder is one of the coolest devices that you never knew you needed. 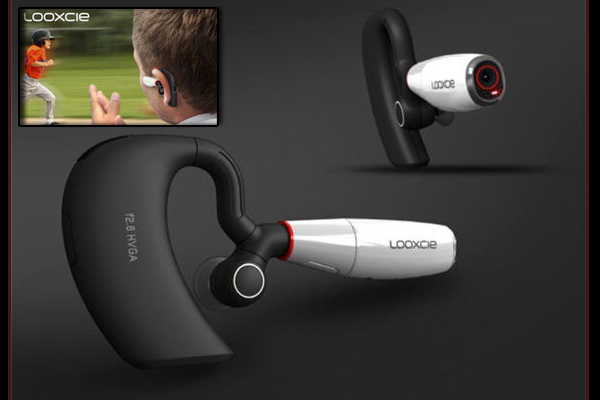 Not much larger than the normal Bluetooth headset, the Looxcie is a Bluetooth enabled camcorder that records what you see. Why bluetooth enabled? Well, with the appropriate app, this small wonder can be used to record to your smartphone for easy sharing over email and social networking sites. You can also use your phone as a viewfinder to easily see exactly what your looxcie is capturing. One of the coolest features of this device is that you don’t have to hit record to capture something. Looxcie is always recording and anytime something cool happens you just tap the ‘instant clip’ button to save a clip of the last 30 seconds. So if you see something awesome just tap the button and you’ve got a clip to share. Hold the button for 3 seconds and it’ll automatically send the clip to a predesignated email address over your phone’s data connection. You can record clips directly to your phone of up to 30 minutes in length. It also functions as a bluetooth headset for your phone and it automatically mutes the audio you’re recording if you take a call while taking video. So how much for all these features in a tiny futuristic package? This little device is priced at $199. Cool things you could do with this? Many. Pretty much anytime where it’d be cool to get a person’s POV of an event you can capture it with this device. Any time you’re somewhere and something cool could happen any minute, but you don’t know when – just hit the instant clip button and you have a clip of it saved to your phone. I’d like to wear one while playing frisbee and watch the whole game from my perspective. Do a whole sunday with lots of people wearing these and intercut the footage to make a highlight video. Youth videos? Awesome. Skiing videos? Awesome. Recap videos? Awesome. Some features I’d like to see added in the next version? The main thing is HD video. You can tell that they’re just trying this device out. It’ll be serious when it goes HD. Next I’d like to see an image stabilizer to make up for the rolling shutter CMOS chip. And finally I’d like to see them make a waterproof version. Imagine swimming around wearing one of these, or taking it water skiing? Awesome. So yeah, I’m excited about the possibilities here.